What Are Some Good Signs My Dentist is Reputable? 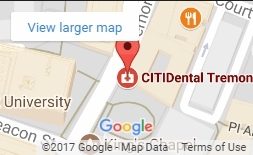 In the age of the internet, there are of course no shortage of places to check reviews on dentists. In addition to online reputation, your dentist should be properly licensed and certified. At CitiDental, we are OSHA trained and compliant, and the practice is in good standing with the Massachusetts Dental Society and the board of health. Can You Help Explain What My Insurance Covers? Absolutely. As part of our services, our Office Manager will sit down with you and sort through your policy and what all that insurance covers. They can then discuss with you what is covered and work out a plan for payment. What Happens During a Normal Visit? A visit to the dentist is more than just a teeth cleaning, although you will receive a cleaning and polishing from one of our friendly, experienced dental hygienists. The visit is also a chance for the dentist to sit with you, evaluate your needs and to see if you are experiencing any pain or sensitivity. We will sometimes perform x-rays of your teeth as well so that we can be better informed on the proper treatment to recommend. It depends on the specific treatment. The regular cleaning and examination typically takes about an hour but can take up to an hour and a half. We recognize that our patients lead busy lives and will do our best to provide you with an accurate time frame for your procedure. Prevention is the best form of medicine, and if we can catch a potential problem early then the chances of minimizing pain increase considerable. That’s why we recommend scheduling a checkup once every six months, or twice a year. That allows us to monitor any issues and fight them before they become severe. Brushing your teeth twice a day will go a long way towards fighting potential cavities, and performing regular dental check-ups in our office will help prevent them as well. The American Dental Association also recommends sealants as a weapon for battling tooth decay. These thin coatings on the chewing surfaces of the teeth act as a barrier against bacteria. For more information on getting sealants, visit our offices.